The principal advantage of volitional tests is that they give an estimate of inspiratory or expiratory muscle strength, are simple to perform, and are well tolerated by patients. Passage of balloon catheter systems into the esophagus and/or stomach is not usually required. However, it can be difficult to ensure that the subject is making a truly maximal effort. Although normal subjects can potentially activate peripheral and respiratory muscles fully during voluntary efforts (29), even experienced physiologists cannot always do this reliably for respiratory efforts (30) and naive subjects have even greater difficulty (31). Thus, it is hard to be certain whether low mouth pressure measurements truly represent reduced strength, or merely reduced neural activation. Indeed, there may be some activation of agonist muscles simultaneously (32). However, in practice a normal result can be of value in precluding clinical weakness. Scientific basis. Measurement of the maximum static inspira-tory pressure that a subject can generate at the mouth (PImax) or the maximum static expiratory pressure (PEmax) is a simple way to gauge inspiratory and expiratory muscle strength. The pressure measured during these maneuvers reflects the pressure developed by the respiratory muscles (Pmus), plus the passive elastic recoil pressure of the respiratory system including the lung and chest wall (Prs) (Figure 2 ). At FRC, Prs is zero so that Pmo represents Pmus. However, at residual volume (RV), where Pimax is usually measured, Prs may be as much as —30 cm H2O, and thus makes a significant contribution to Pimax of up to 30% (or more if Pmus is decreased). Similarly, PEmax is measured at total lung capacity (TLC), where Prs can be up to +40 cm H2O. Clinical measures and normal values of PImax and PEmax do not conventionally subtract the respiratory system recoil. The mouth pressures recorded during these maneuvers are assumed to reflect respiratory muscle strength (Pmus) if Prs is subtracted. However, maximum muscle strength in skeletal muscles is the force developed under isometric conditions with a muscle at its optimal length. In generating pressures during respiratory maneuvers, muscle shortening (or lengthening) may occur, with changes in force-velocity and force-length relationships (34-36). The relationship between the tension (force) generated by a respiratory muscle (strength) and the pressure produced in the thorax or mouth is complex. The diaphragm is both a curved structure and acts as a piston so that the pressure or force per unit area output is only indirectly related to muscle tension. In addition, the mechanical linkage of each individual respiratory muscle within the chest wall and with other inspiratory or expiratory muscles influences the net pressure produced. Thus, even though activation may be maximal, the pressure produced is derived from a complex set of interactions within and between muscles and the chest wall and its contents. Nevertheless, it is the pressure developed by the inspiratory muscles that drives ventilation and, in spite of the many assumptions, these measures can usefully reflect global respiratory muscle strength for clinical evaluation as well as physiological studies. Thus, when respiratory muscle weakness occurs, the PImax can be more sensitive than the VC because the relationship between VC and PImax is curvilinear (37), so that decreases in respiratory muscle strength occur before decreases in lung volume can be identified. On the other hand, between- and within-individual variation in muscle strength is considerably greater than that for vital capacity. Between-individual variability may reflect the large variations in strength in normal individuals. Because of the force-length relationship and the varying contribution of Prs, PImax and PEmax vary markedly with lung volume (38). Subjects find it easier to maximize their inspira-tory efforts at low lung volumes and expiratory efforts at high volumes; therefore, by convention and to standardize measurement, PImax is measured at or close to RV and PEmax at or close to TLC. In some laboratories PImax and PEmax are measured at FRC, and this may be more accurate for certain research studies, but in this case the lung volume should be specifically stated (39). In patients with abnormally high lung volumes (e.g., patients with COPD), a low Pimax may partly reflect the shortened inspiratory muscle fiber length associated with increased lung volume at RV rather than reduced inspiratory muscle strength (Figure 3). Furthermore, hyperinflation is often associated with intrinsic positive end-expiratory pressure (PEEPi), so inspiratory efforts start from a negative airway pressure. Thus, if Pimax is measured as the maximal negative airway pressure, it will underestimate the actual pressure generated by the inspiratory muscles. Optimally, under such circumstances, Pimax should be measured as the total negative deflection of the occluded airway pressure during the inspiratory effort, including the effort required to draw down PEEPi. Methodology. A number of authors have reported normal values for Pimax and PEmax (see Table 2 [26, 40-44]). The variation between these results presumably indicates differences between the groups studied and the way in which the tests were performed and measured. Here, we propose a standardized approach to test performance and measurement. Figure 2. Relationship of muscle and respiratory pressures at different lung volumes. Vertical axis: lung volume as a percentage of vital capacity (%VC). Horizontal axis: alveolar pressure in cm H2O. The broken lines indicate the pressure contributed by the muscles. Pmus = pressure developed by the respiratory muscles; Prs = pressure of the respiratory system. 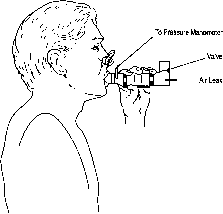 Reprinted by permission from Reference 33.
can be attached to a short, rigid tube with a three-way tap or valve system to allow normal breathing followed by either a maximum inspiratory or expiratory maneuver (Figure 4). For research studies it may be preferable to use a rubber tube as mouthpiece (26). However, this has to be held tightly around the lips, to prevent leaks. This can be difficult for patients and naive subjects particularly at high pressures, leading to significant pressure losses. The system requires a small leak (approximately 2-mm internal diameter [id] and 20-30 mm in length) to prevent glottic closure during the Pimax maneuver and to reduce the use of buccal muscles during the PEmax maneuver. The inspiratory and expiratory pressure must be maintained, ideally for at least 1.5 seconds, so that the maximum pressure sustained for 1 second can be recorded. The peak pressure may be higher than the 1 second of sustained pressure but is believed to be less reproducible. Historically, the aneroid manometer was used to measure the pressure but this is not recommended as the analog signal on the dial can be difficult to read accurately and pressure transients are difficult to eliminate. Mercury should be avoided for safety reasons. A recording system should be used to collect the pressure data and display it in analog form (strip chart recorder), or it can be digitized and displayed for measurement (28) or the 1-second average computed (Figure 5). The pressure transducers should be calibrated regularly against a fluid manometer with baseline pressure equal to atmospheric pressure. The test should be performed by an experienced operator, who should strongly urge subjects to make maximum inspira-tory (Mueller maneuver) and expiratory (Valsalva maneuver) efforts at or near RV and TLC, respectively. Subjects are normally seated and noseclips are not required. Because this is an unfamiliar maneuver, careful instruction and encouraged motivation are essential. Subjects often need coaching to prevent air leaks around the mouthpiece and to support the cheeks during the expiratory efforts, and this may be helped by having them pinch their lips around the mouthpiece. Once the operator is satisfied, the maximum value of three maneuvers that vary by less than 20% is recorded. Less variability may be necessary in a research setting, but even low variability may not guarantee that maximal efforts have been made (45). Advantages. The pressures measured at the mouth during maximum inspiratory or expiratory maneuvers are widely used specific tests of respiratory muscle strength. Normal values are available for adults, children, and the elderly. The tests are not complicated to perform and are well tolerated by patients. The recent development of hand-held pressure meters means the technique may be easily used at the bedside (28). Figure 3. Relationship between maximal static respiratory pressure (Pimax, PEmax) and lung volume. Pressures are expressed as a percentage of maximum and the lung volume is expressed as a percentage of TLC. Symbols are data from different studies (39). Example A represents a patient with emphysema whose RV is 85% TLC, at which lung volume his predicted Pimax is only 50% of that at normal RV. Con-versly, Example B represents a patient with lung fibrosis with TLC of 55% predicted, at which volume her PEmax is 82% maximum. Reprinted by permission from Reference 39. Disadvantages. These tests are volitional and require full cooperation. Accordingly, a low result may be due to lack of motivation and does not necessarily indicate reduced inspira-tory or expiratory muscle strength. Normal values and applications. The recorded values of Pimax and PEmax may be compared with published normal values (Table 2). The values that most closely reflect the protocol described here with a flanged mouthpiece, are those obtained by Wilson and coworkers (43). Normal values for the elderly (4648) and children (43, 49-51) have been reported. The normal ranges are wide (Table 2), so that values in the lower quarter of the normal range are compatible both with normal strength and with mild or moderate weakness. However, a Pimax of —80 cm H2O usually excludes clinically important inspiratory muscle weakness. Values less negative than this are difficult to interpret and in such circumstances it would be appropriate to undertake more detailed studies. A normal PEmax with a low Pimax suggests isolated diaphragmatic weakness. Definition of abbreviations: PEmax = maximum static expiratory pressure; Pimax = maximum static inspiratory pressure. * Values represent kilopascals (1 kPa = 10.19 cm H2O), mean ± SD. Reprinted by permission from Reference 27. Figure 4. Measurement of maximal static respiratory pressures. A flanged mouthpiece with a nose clip is the preferred technique. A small leak is introduced into the system, and a valve system allows a normal breath to be followed by a maximum maneuver. loon catheter systems passed into the esophagus (see Techniques for Pressure Measurements) to measure Pes as a reflection of Ppl or into the stomach where Pga can be used to reflect Pab. Esophageal pressure does not include lung elastic recoil pressure but does include chest wall recoil pressure. The main indication for balloon catheter measurements of maximum respiratory muscle pressures is to estimate the strength of the separate muscle groups, notably the diaphragm (from Pdi), or to measure strength when the patient is unable to maintain a proper seal around the mouthpiece. With the balloon catheters in place, various maneuvers can be used to assess global inspiratory muscle or diaphragm strength. These tests are usually performed at FRC. In the Mueller (maximal inspiratory) maneuver the diaphragm and inspiratory muscles are contracted with the aim of creating the biggest negative thoracic pressure without regard to abdominal pressure. However, this usually does not generate maximum Pdi (25, 52). As an alternative, the subject may perform an expulsive maneuver, wherein the individual is requested to "bear down as for defecation" and simultaneously superimposes a Mueller maneuver. When given visual feedback, this complex maneuver can be mastered by trained subjects to give the largest values of Pdi (up to 240 cm H2O or more) (53). It may reflect nearly maximal neural activation of the diaphragm, perhaps with fiber lengthening (52, 54). However, the technique is difficult for naive subjects and in the clinical setting (55). Twitch occlusion studies have confirmed that such maneuvers can produce maximal neural activation of the diaphragm (56). Advantages and disadvantages for regional measurements. The measurement of maximum static transdiaphragmatic pressure, Pi,di,max, produced during the described maneuvers, can provide specific information about maximal diaphragm strength. However, these tests require passage of balloon catheters and the necessary coordination is difficult for naive subjects and patients. There are limited normal data. 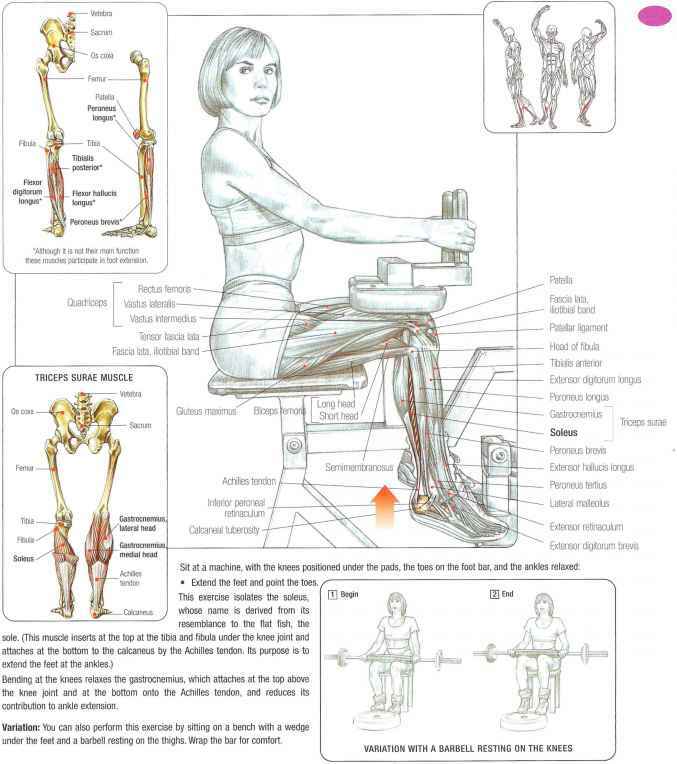 It is difficult to control for muscle (fiber) length, and for velocity of shortening. This test is recommended only as a research tool or in respiratory muscle function laboratories with specialized expertise.